Often times, major cities get mixed reviews. Budapest is not one of those cities. Find someone who has visited, ask them how they liked it, and I guarantee they won’t have a bad thing to say. Not only is the city extremely affordable, but there will never be enough time to visit all of the amazing restaurants and cafes it has to offer. As for the sightseeing, no photographs will ever do its brilliant attractions justice. That said, we all need somewhere to start. Over the course of my two week stay, I collected a list of my best recommendations. Read on for must-see spots, delicious restaurants, great cafes to work from, nightlife areas to check out, and more. This iconic square is the city’s largest, and is famous for the Millennium Monument that you see pictured below. It was built in 1896 to commemorate the thousandth anniversary of Hungary. I didn’t visit, but the Museum of Fine Arts is located just to the left of the square if you’d like to kill two birds with one stone! Located just behind Heroes Square you’ll find Vajdahunyad Castle. The colors of Autumn made walking around the gardens particularly magical, but I’m sure it is gorgeous any time of year. Szent Istvan Bazilika, or in English, St. Stephen's Basilica, is a notable Roman Catholic basilica in Budapest. You can always visit during the 9 AM - 5 PM opening hours, but I decided to get tickets to an evening organ concert being held inside instead. It was a great way to take in the incredible interior details and also enjoy some beautiful music for an hour. For more information about the concerts and dates, budapestconcert.com has everything you need to know! I would also be remiss not to mention Gelarto Rosa, the fantastic gelato shop located just to the right of the basilica. Not only is the rose-shaped gelato delicious, but it’s picture perfect, too. What. A. Gem. I’m pretty sure I stumbled upon this place on Instagram, and boy am I glad I did! While most of this library is pretty standard, these study rooms on the 4th floor are TO DIE FOR. When you visit, you’ll need to pay…but here’s a little tip. Instead of paying the 1,000 HUF day rate, sign up for a library card. It’s 200 HUF, or about 0.71 USD, and it’s good for a whole year! Plus it’s a fun little souvenir. While I did not go IN Buda Castle, it is too darn pretty not to at least go see. Especially at night. The Chain Bridge is a pretty impressive structure as well, and I encourage you to take a walk across it. It spans the Danube River, and joins the Buda side with the Pest side of the city. To be honest, I didn’t even know the two sides existed until I arrived. Buda is quite hilly while the Pest side is very flat. By far the most well-known building in Budapest, Parliament is as remarkable on the outside as it is on the inside. Be sure to book a tour. It’s fairly quick (about 45 minutes or so), but the amazing interior will not disappoint. I was particularly enamored with the Grand Stairway (third photo.) For information about purchasing tickets, click here. Given that Budapest is quite famous for its thermal baths, you should probably visit one! There are several around the city, including Szechenyi and Gellert, but I opted to visit Rudas, which was in close proximity to a wine event I attended. It was not as picturesque as the photos I’ve seen of Szechenyi, for example, but it was still a unique and enjoyable experience. I brought my own towel and flip flops, paid the fee, and they gave me a wristband that locked and unlocked my locker. Fancy! Mazel Tov is an absolute dream of a restaurant that was conveniently located right next to my Airbnb. The interior is jaw-droppingly beautiful, and they offer a Middle Eastern-style menu with a pretty incredible brunch. Pictured is the banana french toast filled with red berries. Yup, it was as delicious as it looks. If you’re a lover of ambiance, Hilda is your spot. The mural pictured below is the restaurant’s focal point, while other charming and colorful details can be found all around the large dining room. This omelette was also one of the tastiest omelettes I’ve had in a long, long time. Vintage Garden is a little kitschy, but I found it to be quite cute. It has a very Instagrammable courtyard (which was full at the time of my visit so I got plopped inside) and they offer a variety of things on their menu which, much to my delight, included mac and cheese. They have a bajillion flavors of lemonade (I opted for rose) and that chocolate cake on the right…yeah, that was pretty tasty. When in Hungary, you obviously need to try some local Hungarian dishes. My friend Mira, who I met through the Wifi Tribe, is Hungarian, and she chose Getto Gulyas to give me my first taste of her country’s famous hearty cuisine. I went for a goulash soup, of course, which was the perfect solution to the chilly weather outside. The menu is full of soups and stews- the perfect comfort food. We also shared a Hungarian sponge cake and the homemade curd cheese dumplings for dessert, the latter of which sounded horrendous at first but actually tasted pretty good! If you’re trying to beat the cold, a glass of red wine is always a nice addition. The restaurant was pretty packed on a weeknight, so reservations are recommended. Are you a big fan of breakfast? Stika is a cute little joint in Budapest’s Jewish Quarter that has a great menu, including my personal fave, eggs Benedict! They also serve pots of tea which is another essential to starting my day! There’s not a ton of seating inside, so you may end up out on the patio area. It seems to draw a lot of foreigners rather than locals, but it has a reputation amongst the travel community for a reason- the food’s delicious! Fekete is a great little work spot with tables inside and out in the atrium area you see pictured here. They serve food up until 2 PM, after which you can still grab a quiche or some pastries. Coffee and tea are of course, on the menu, and the Wifi was good! Of all the cafes I visited while in Budapest, Magveto had the most creative seating arrangements. While there are normal tables, there’s also this nifty area of steps doubling as seating surrounded by book cases. I found it quite charming. If you’re looking for good Wifi, a nice warm beverage, and a pastry or snack- this is a great spot to hunker down and get some work done. I worked from Madal twice while I was in Budapest. There are actually three locations around the city, but the one I opted for was the Ferenciek tere 3 location. The cafe has a warm atmosphere, good drinks, and upstairs seating that overlooks the entrance and counter below. My only issue was that it closed around 7 PM, and my work schedule in Europe has me going until 10 or 11 PM. And when all else fails, or you just feel like being basic- there’s always Starbucks. Anyone who has been to Budapest will recommend that you visit Szimpla Kert, an extremely eclectic ruin bar in the Jewish Quarter. It feels like an endless maze of sensory overload (in the best way possible) and is full of a whole lot of wonderful trinkets. For one of the best nightlife spots in the city, definitely give it a visit. I only strolled through Gozsdu one evening on my way home, but it is full of restaurants and bars, each one more inviting than the next. My local friend highly suggested it as a nightlife destination, and with the abundance of places to go, I can see how it’d be pretty great. And when you’re over the partying and just want to sip on a cocktail in a beautiful setting- High Note Sky Bar. You’ll walk through one hell of a lobby, complete with piano key path, take the elevator up to the roof, and enjoy views of the whole city and the basilica next door. Not sure where to stay? 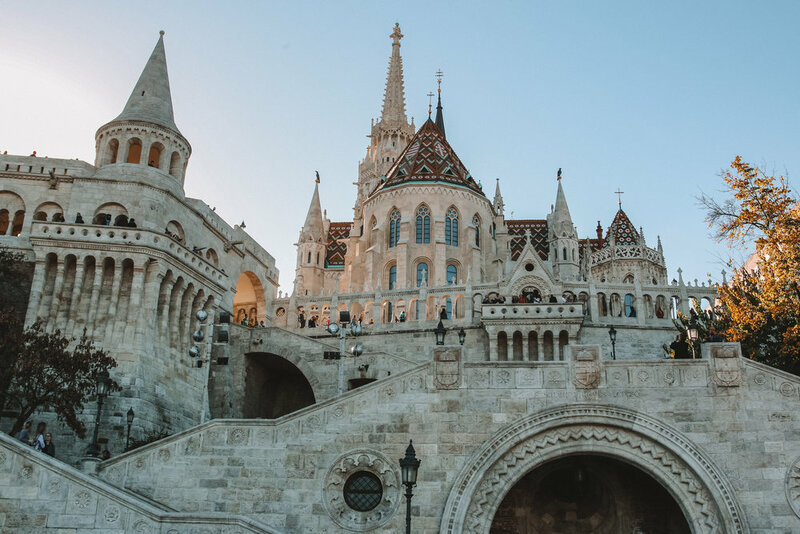 Airbnbs in Budapest are extremely affordable and WIDELY available. I loved my vintage apartment, which, for an entire apartment, was a steal at $32/night. Click here for the listing. If you’ve never signed up for Airbnb and want $40 off of your first stay of $75 or more, sign up using this link! So hopefully you’re pumped to go to Budapest now! Any other great recommendations that people could benefit from!? Leave them in the comments!